The exhibit caters to Floridians' love of butterflies and it is a new discovery the whole family will enjoy at The South Florida Science Center and Aquarium. Given our fascination with butterflies, it is rightfully fitting that we would be curious about their mysterious and amazing world. Their beautiful scaled wings like royalty fly, spreading their magical pixie dust over our fields, gardens, and yards. Do a Google search, and it will produce over 13 million page results, with interesting data backed by real stories about how butterflies’ natural world connects some people with hope, and a desire to see life through a more colorful lens. From a more scientific point of view, if you set out to discover the mysterious lifecycle of caterpillars and butterflies, you will find that their intricate metamorphosis process—from egg to caterpillar, from cocoon to adult butterfly—is not that very different from humans’ lifecycle. Butterflies love the tropics. And, South Florida, with its abundance of sun, rain, and assortment of flowers, boasts almost 200 out of the 765 butterfly species that can be found in North America. Home seasonably or year-round, you can spot a Monarch, Palamedes Swallowtail, White Peacock, Miami Blue, Florida Leawing, Tropical Checkered Skipper, Nickerbean Blues, Gulf Fritillary, Dorante’s Longtail, Orange Sulphur, Queen Danaus Gilippus, or a Dina Yellow, at any given time. Zoom in on a Monarch, and you will understand why it has earned “king” as its nickname, and most beautiful of all butterflies. Catering to Floridian’s love of butterflies is The South Florida Science Center and Aquarium in West Palm Beach. Its new exhibit, “Amazing Butterflies,” presents a new discovery the whole family will enjoy until September 29. “We wanted something very kid friendly, and since mazes are one of children’s favorite games, the center designed a maze that represents the life of a butterfly,” says Kate Arrizza, Chief Operating Officer, as she directs us to the start of the maze. We enter the long and curvy, yellow tunnel shaped like a caterpillar. This interactive Science exhibit continues with a series of temporary walls positioned in perfect order, directing us throughout the next eight stamp stations. Each station has a unique activity that demonstrates the eight different phases of metamorphosis, or the lifecycle of a butterfly. Because the maze has been openly designed, at every step kids can see what others are doing in the next station, joining in the fun. As a butterfly, you discover what you eat, who’s trying to eat you, what are your dangers, and what are your defenses. And if you are a kid [or a kid at heart], you may get to experience some of these adventures as you and your team learn to walk together like a caterpillar, or climb a spider’s web and learn to survive without getting eaten by a spider. Before the end, you will discover how butterflies get their color and find their mates. The finale is the best, as you zip-line across a short stretch as if you were taking flight like a butterfly. An activity not to be missed is the Caterpillar Crawl. Now, in order to walk like a true caterpillar, you need to know that this funny looking insect has hundreds of muscles—all working in unison, which make caterpillars very strong. Kids find a new challenge as they try to make it across the long line together at a crawling pace. Changing Into a Butterfly. Fifth grade students, Annabelle and Lexi, from May Sands Elementary in Key West pretend they are butterflies in the making. Everything that you see here is Florida themed. In the aquarium, there are over 10,000 gallons of water in tanks that accommodate 91 different fish species—all Florida native, except for the fish that are inside a pop-up tank. This tank only has Pacific Ocean fish in it, and was custom designed by a company called Living Color. It allows you to actually crawl underneath and stand in the middle of the tank, giving you the allusion that you are at the bottom of a Coral Reef. Kids love sharks. They are fascinated by the way they move in the water. While the nose sharks in this tank are small in size, there’s a large exhibit of a Great White’s jaw nearby. Great whites are the world’s largest predatory fish, according to Arrizza. They are found mostly along the coasts of northeastern United States, California, South Africa, and Australia. The Everglades is filled with fascinating insects, reptiles and amphibians. In their surrounding fresh water you can find fish, turtles, and alligators—all native to South Florida. In this exhibit, you will also learn where our Florida water comes from, or the different species and specimen found in this semi, under explored area that is the Everglades. Most of the information that you find at the Science Center is interactive. iPads and computers with touch screens have been placed throughout the different areas for kids to play and experiment as they learn. The Planetary Sphere is a quarter million dollar exhibit, founded by the Quantum Foundation. Everything that NASA and Nova tracks, the Science Center controls on a computer that has over 700 data sets. From tides, currents, meteors, hurricanes, migrations of whales and sharks, the information gets updated nightly and is projected on four state-of-the-art laser projectors that transmit the data feed in real time. This is also a great teaching tool, which Palm Beach County teachers use in coordination with their curriculum. The latest addition to the Science Center is the Conservation Course that includes an 18-hole Miniature Golf course, the first ever designed by Gary Nicklaus, son of legendary Jack Nicklaus, and Fabrizio Zanetti, a Paraguayan professional golfer who plays on the European Tour. The amazing thing is that this miniature golf course was built inside a butterfly garden, so everything around, including the trees and plants attract butterflies. When you are out there golfing, they will land on you! It is the most beautiful, peaceful thing. The Amazing Butterflies exhibit is definitely the main attraction at the South Florida Science Center and Aquarium at this time, but you can’t ignore the rest of the animal kingdom that lives here. Not to mention, the interactive earth science and astronomy areas that have made this learning center one of the most important in Florida. After the “Amazing Butterflies exhibit, next on their list is the “Astronaut” exhibit, created by NASA in 2015. It is slated to run from October 2017 – April 2018. This exhibit will have lots of activities geared towards family based learning projects, and will help answer the question, how do you become an astronaut? The Amazing Butterflies exhibit invites you to shrink down into the undergrowth to become one of the most extraordinary creatures on earth. Learn more here. Maritza Cosano is a storyteller at heart. 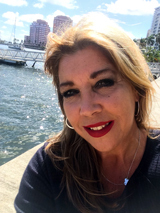 From magazine features to profiles and reviews, as well as web content and TV, film, and video scripts, she’s a versatile writer who covers everything. Her writing is creative, heartfelt, engaging and effective. And her expertise is in storytelling. Follow Maritza at www.maritzacosano.com or email her to maritza@maritzacosano.com.